The past still lives in Umbria's arts and crafts. With all due technological adjustments, craftsmanship has been able to maintain uses and traditions through the centuries. The roots of many Umbrian daily activities delve into this tradition. To trace their origins one has to look back as far as the middle ages, although the Renaissance centuries saw the real flourishing of highly skilled artisans and their arts. It is in these years that Deruta's ceramics and the majolica of Gubbio and Gualdo Tadino become famous, while the production of wrought iron in Città della Pieve, Gubbio, Assisi, Cascia, Magione and Montone is intensified. The fabrics of Perugia gain renown and prestige, even for the tablecloths and lace of Orvieto. The embroidery and wood incisions of Assisi and Città di Castello have the same fame and value for their accurate manufacturing. Ceramics, pottery, weaving, embroidery, wrought iron, and wood are expressions of art that in time have created the artistic and material culture of Umbria. All these artistic crafts can be found applied in traditional homes, especially rural houses such as Umbria villas, so charming and welcoming for your holidays. 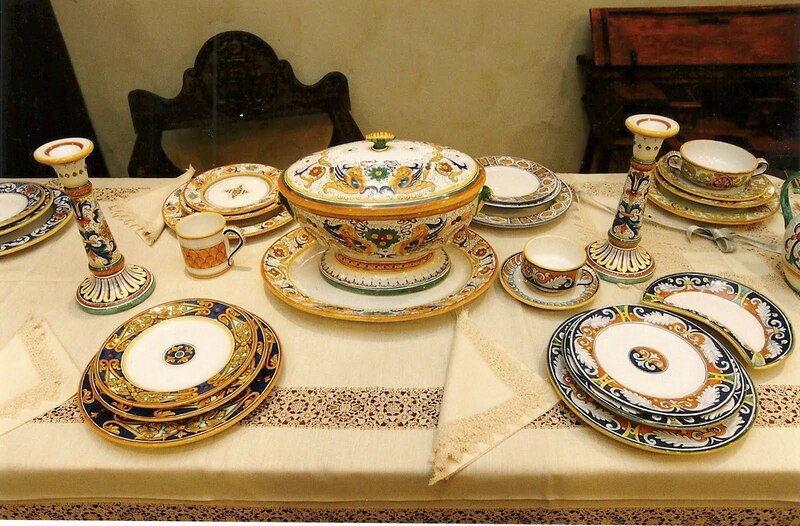 In Deruta the art of ceramics has been handed down since the Etruscans. Today's production continues an art that began with precious archaic medieval pottery. It established itself during the Renaissance, when Italian and foreign noblemen commissioned dishes, cups and glasses with beautiful iridescent, golden and reddish colors to craft shops. Pinturicchio and Perugino's fresoes were also an inspiration that contributed to the success of the production of Deruta. The production of Gualdo Tadino is prestigious. Ceramic objects in Gualdo were already in place during the Fourteenth century, as it is mentioned in the Gubbio reforms. The production of pottery, especially white majolica, continues to grow without interruption and without major hiccups throughout the Seventeenth and Eighteenth centuries up to the high standards of today. The production of fabrics is practiced in Umbria since the Twelfth century. The processing of these fabrics in time became famous all over Italy and throughout Europe. It is inspired by Middle Eastern culture and is expressed with geometric motifs and decorations, human figures, animals and augural phrases. Today's revival of Medieval and Renaissance techniques and models resulted in the resumption of manual weaving. There still are craftsmen using ancient wooden looms, respecting the tradition in technical, design, and color. Today there are factories that have centuries of history and are on the market with a rich and handicraft production of high value. Wrought iron production is a specialized craft typical of rural culture. The major production centers are in Assisi, Citta della Pieve, and Gubbio. The latter is Umbria's capital for this production, and it excels in the repruduction of ancient models of weaponry. Cascia was specialized in the production of grippers for hosts. Norcia in the Sixteenth century was dedicated to the production of surgical instruments, Villamagina in files and rasps, while Magione was devoted to copper processing. Woodwork has a long lasting tradition in Umbria. The manufacture of everyday objects and the art of carving is born in the countryside. It is often expressed in the decoration of churches and palaces; throughout the Renaissance and the Baroque periods these are the two ways in which this ancient and lively art is applied in Umbria. Nowadays Citta di Castello and Gubbio have small industries of furniture, restoration workshops and antique shops. Todi includes carvers, furniture makers, sculptors, restorers, craftsmen, manufacturers of furniture and numerous antique shops; Assisi and Perugia boast restorers and antique dealers.